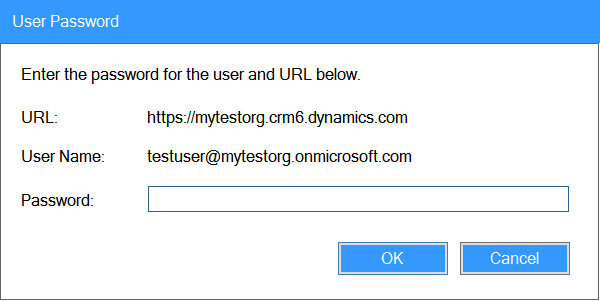 In previous versions of CRMQuickDeploy, if your connection string requires a password, then the password needs to be specified as clear text in the connection string. While the password is not checked in to source control, and is not saved to disk in clear text, it can still lead to some pretty awkward situations. With the latest version (3.5.3) of CRMQuickDeploy you now have the option of not specifying the password in the connection string. When a deployment is triggered, the tool examine the connection string to see if a password is required. If a password is required, and is not specified in the connection string, then a dialog is shown to prompt you to provide your password. The password that you provide is not written to any file and is cached for the remaining of the Visual Studio session. You can still specify the password in the connection string if you wish, although this is generally not recommended (unless you are using a dummy account for deployment). If you do this, CRMQuickDeploy will work as it always has been and you will not receive the prompt to enter your password on deployment. You can download CRMQuickDeploy from the Visual Studio Marketplace. This entry was posted in CRM, CRM Portal, CRMQuickDeploy. Bookmark the permalink.